Universal Pictures is making a big event out of the trailer reveal for Jurassic World: Fallen Kingdom on Thursday. They've been releasing a steady stream of short teasers, giving us glimpses of footage from the highly-anticipated sequel. Now, changing things up a bit, they've released a hilarious video, featuring Chris Pratt and Bryce Dallas Howard, with filmmaker Zach King, to further hype up the trailer. 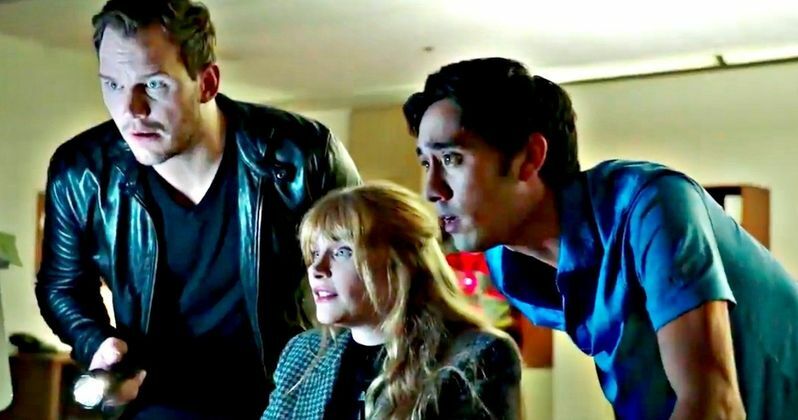 The video features Chris Pratt and Bryce Dallas Howard watching the trailer with Zach King when things start to go awry. They then have to upload the Jurassic World: Fallen Kingdom trailer online, all while a velociraptor hunts them in the shadows. It sounds dark, but in the vein of King's YouTube videos, it's pretty funny. And, as we know, Pratt has some serious comedy chops. Zack King had this to say when he posted the video to his Twitter account. "I'm totally getting fired. w/ @prattprattpratt @brycedhoward @aaronsanimals & @thesupercole Trailer Thursday #ad @JurassicWorld #fallenkingdom #moredinosaurs #bestjobever"
The video plays on some of the most famous imagery from the original Jurassic Park, even though they're in an office building, the comedic tension plays on the kitchen scene, before transitioning into Bryce Dallas Howard trying to upload the trailer using a Unix system. Just as Lex uses to fix the security doors in the movie. Oh and there's definitely a cat dressed up as a dinosaur, if you needed more reason to check this out. Chris Pratt even manages to sneak in one of Jeff Goldblum's classic lines from the original movie. It's not unusual for studios to make a big deal about the release of a trailer for a blockbuster movie, but Universal is really pulling out all of the stops for Fallen Kingdom. Then again, why wouldn't they? Jurassic World remains the fourth highest-grossing movie of all time, with $1.67 billion worldwide. The movie only trails Star Wars: The Force Awakens, Titanic and Avatar. If this movie is any good, they have every reason to believe they have a massive hit on their hands and they clearly want Jurassic World 2 to be hyped up in a big way. Jurassic World 2 is positioned to be one of the biggest movies of the 2018 summer season, with the movie set to arrive in theaters on June 22. The movie is directed by J.A. Bayona, with a script from Jurassic World director Colin Trevorrow and Derek Connolly. The trailer is going to drop during Thursday Night Football, but there's always a chance it could arrive early. So be sure to keep your eyes peeled. While you wait, be sure to check out the new Jurassic World: Fallen Kingdom teaser video, courtesy of Zach King, for yourself below.